Reginald 'J.R.' 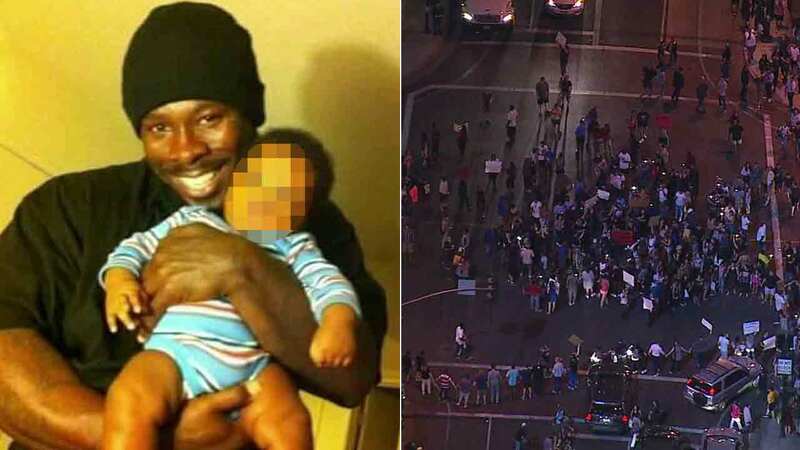 Thomas is seen in a photo provided to Eyewitness News by his girlfriend's brother (left) About 100 people gather in protest (right). PASADENA, CA -- A black man died in Pasadena after police used a Taser on him during a confrontation and struggle early Friday morning, authorities said, which prompted protests day and night from community members who demanded answers from investigators. The Pasadena Police Department at about 2 a.m. received two family disturbance calls just 30 minutes apart, Los Angeles County Sheriff's Department Capt. Steven Katz told reporters during a chaotic press conference attended by Black Lives Matter protesters at the scene. Because the first call was made from a cellphone, police were not immediately able to determine its location. LASD officials confirmed in a press release the incident occurred at the Orange Grove Gardens apartment complex in the 200 block of E. Orange Grove Boulevard. "A struggle could be heard over the phone when that second call was made. In addition, an individual was reported as being in possession of a knife as well as a fire extinguisher," Katz said, adding that the identity of the individual was reported on the call. Sheriff's officials said Pasadena police officers responded and upon their arrival, the officers were confronted by the man, who was carrying a large knife under his left arm and a fire extinguisher is his right hand. Officers gave verbal commands to drop both weapons and when the man did not comply, a Taser was deployed, which caused the man to drop the items. Investigators said the man still was not cooperative and a second Taser was deployed, which seemed to have little effect on him. Pasadena officers got into a physical struggle with the man and applied a hobble restraint around his feet in order to control his legs. According to the sheriff's department, when the officers realized the man was "in distress" while in custody, they removed the restraints and began to perform CPR on him. The Pasadena Fire Department responded, and firefighter-paramedics took over the life-saving efforts. "Ultimately, the individual passed away," Katz said. The exact cause of death will be determined by the Los Angeles County Department of Medical Examiner-Coroner, according to the LASD press release. Authorities did not release the man's identity, but his girlfriend's brother told Eyewitness News his name was Reginald "J.R." Thomas. Family members said he was a father of eight and has another child on the way. Friends and family said Thomas suffered from mental illness and called police for help. They said when police arrived, that's when the incident occurred. "As of now in his life I had a conversation with him about a month ago, and he was like, 'Man, I got to get my life together. I got all these kids to come home to. They smile, they look up to me, so I don't need a job. I sit in here all day and take care of my kids,'" shared his brother-in-law Forrest Elders. Several protesters shouted out during the press conference, including a woman who insisted: "We want the officers' names that killed him! We demand the officers' names!" The outcry from family, friends and community members did not end at the scene. Protesters took to the streets to hold a vigil and march for Thomas. "He was a good, good man, and it just shouldn't have happened," cried Joyce Thompson, Thomas' girlfriend's mother. "And I just want everyone to know that we loved J.R. "We really loved J.R. this shouldn't have happened, and we're going to miss him dearly." The passionate protest against police started with a candlelight vigil in front of the the apartment where Thomas died. Then, hundreds of protesters took to the streets of Pasadena, stopping first in front of the police station. Crowds eventually gathered in the intersection of Colorado Boulevard and Fair Oaks Avenue, shutting it down completely. The march then ended back at the scene of Thomas' death. Officials released security video of the response. You can see police officers approaching the man. A 911 call made by a family member was also released. Sheriff's homicide detectives were assisting Pasadena police with the investigation. The officers involved in the incident had not yet been interviewed. "We do not have their statement yet. We will, and at that point, we'll know exactly what was done," Katz said. Anyone with information about the case is asked to call the Los Angeles County Sheriff's Department's Homicide Bureau at (323) 890-5500. Anonymous tips may be submitted by calling Crime Stoppers at (800) 222-8477.